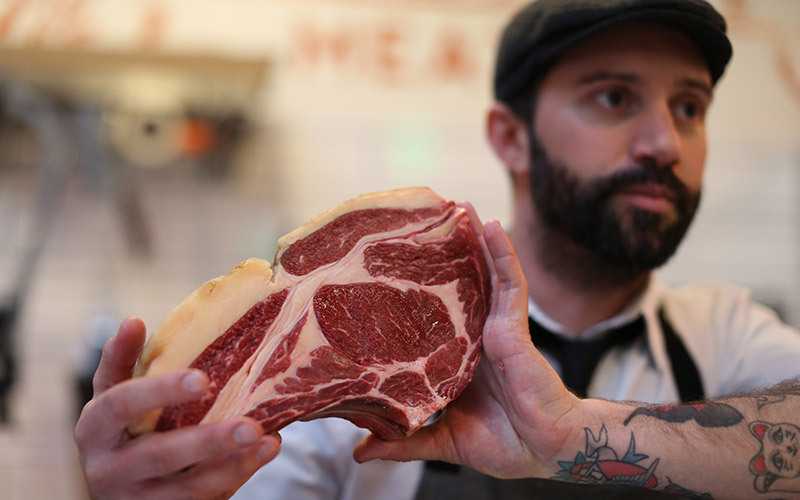 Home Food Butcher Jered Standing Shares His 10 Favorite Dishes in L.A.
Butcher Jered Standing Shares His 10 Favorite Dishes in L.A.
Jered Standing, founding butcher of the original Belcampo, knows meat. He’s passionate about meat. And we love him for that. Standing will be opening his own butcher shop in the Spring of 2017 (first in line) and he creates how-to videos on his grotesquely beautiful website, Mallet and Cleaver. He’s also funny and I feel confident saying he has the best butcher Instagram in the game right now. We asked him what he likes to eat when he’s not at home literally hand-crafting BLTs in his own kitchen, which one can only imagine are life changing, and this is what he said. This was the first thing that came to mind when you asked me about my favorite dishes. I love these! I’m not generally a spicy foods guy, but I’ll sweat through these because they’re so damn good. The skin is super crispy, they’re sticky and sweet and very hot. Plus you can get Hite by the pitcher (which you’ll need)! At this point in my life I’ve kind of grown out of brunch. I don’t know how or when that happened, but I still love breakfast foods, and I love sitting outside while eating breakfast foods. Little Dom’s opens at 8 a.m. Perfect. And I get the pancakes every time. They’re pretty rustic looking, which I love, and the portion size is perfect – I don’t need seven pounds of breakfast dessert eclipsing my plate, a couple small pancakes is great. Really anything from Bestia, but the Lamb Neck especially. Of course it’s delicious (everything at Bestia is), and it’s cooked perfectly (slow-roasted), but I think my favorite part is that it’s served on the bone. That’s a pretty baller move. I mean, it straight up still looks like a neck – you pull the meat away from a small section of spinal column. Fun! Cause I ain’t fancy, and sometimes I want to day-drink on a patio and eat cut up chunks of sausages with toothpicks. And pickles. And mustard. This is the only place I’m ordering a pork chop. Like, ever. It’s a tomahawk rib chop from a heritage pig raised here in California, cooked to your desired doneness (I like medium), and prepared super simply with some sort of really awesome brown butter situation. I was going to say Cheese Fries at Shake Shack, but the more I thought about it the more I realized that the fries are just sort of also there. I’d probably eat literally anything if you put that cheese sauce on it. “Butter cream truffle cheese sauce” sounds like a heavy dish, but I find this to be a good, sort of light, lunchtime option when I’m downtown. I think the whole stuff-on-toast thing has kind of gotten out of hand. I don’t really get it. But the Burrata Toast at Birdie is so simple and so delicious, plus the space is phenomenally gorgeous, and the cocktail program is super solid too.